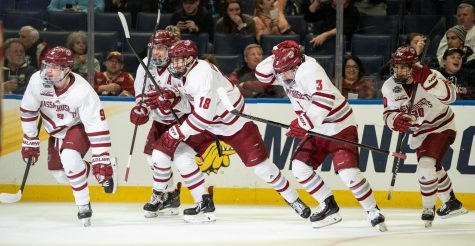 The 3-1 lead that the Massachusetts hockey team built Friday night with eight minutes, 53 seconds left in the third period represents the reach of UMass’ potential. But the two subsequent goals it surrendered to UMass Lowell to tie the game showed how quickly things can get away. 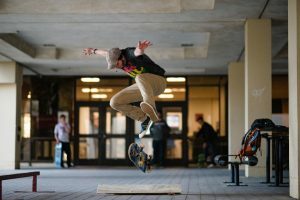 It’s probably deserving, then, that Friday night’s non-conference matchup between the Minutemen and River Hawks ended in a 3-3 tie. 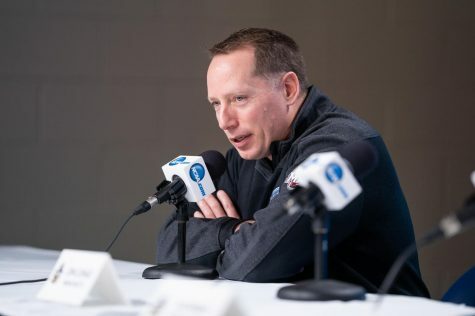 River Hawks coach Norm Bazin was more satisfied with the deadlock given his team’s subpar performance in the first 50 minutes of the game. 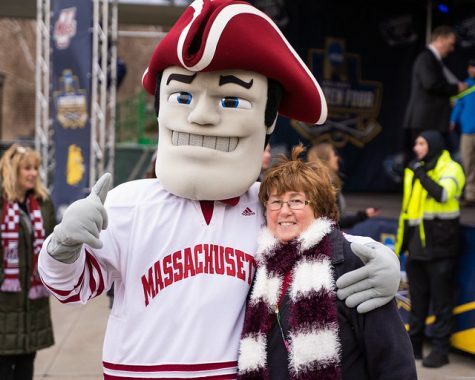 For the Minutemen (9-18-2, 4-13-2 Hockey East), Friday was a chance to clinch the season series against the rival River Hawks (16-10-4, 9-7-3 HEA). 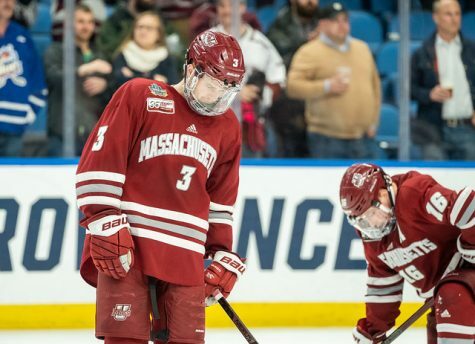 But their recurring third period issues resurfaced Friday night and doomed UMass again. “When we turned the puck over in the third period, they jumped on us really quickly,” freshman center Dennis Kravchenko said. As senior goaltender Steve Mastalerz said after the game, it was not a full 60-minute effort. The River Hawks scored the lone goal of the first period after Ryan McGrath stole the puck from Minutemen defenseman Brandon Montour and beat Mastalerz on his glove side. But Montour made up for his mistake in spectacular fashion early in the second period. After picking up the puck in the defensive zone, the freshman went coast-to-coast to tie the game 1-1, exploding by UMass Lowell defenders and beating goalie Jeff Smith with a wrist shot to the top right corner of the net. 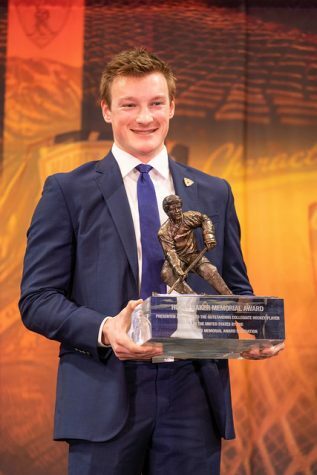 It was Montour’s third goal of the season and 16th point in 14 contests with UMass. 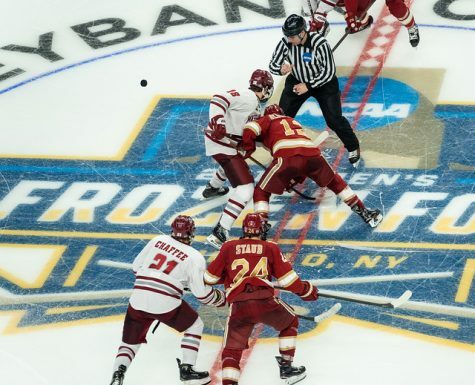 Later in the period amidst a net front scrum, everyone on the ice lost track of the puck except for Minutemen junior Shane Walsh, who found the pick sitting idly on the goal line and easily tapped it in to give UMass a 2-1 lead. Several minutes later, Bazin pulled Smith and replaced him with former UMass goalie Kevin Boyle. Boyle ended up being the goalie of record in the tie, stopping 18 of 19 shots he faced after entering the game. Opposing the River Hawks’ duo was Mastalerz. 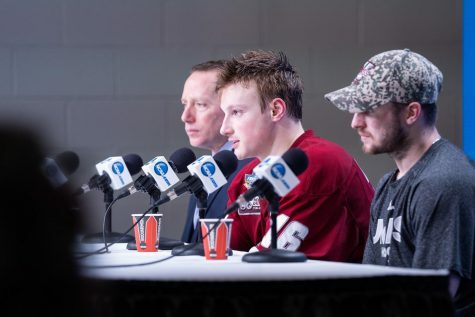 It wasn’t an eye-popping performance but Mastalerz was consistent and made several key saves in the second and third periods to keep UMass ahead. Five minutes, 59 seconds into the third period, Steven Iacobellis scored a shorthanded goal in his return to the lineup to stretch the lead to 3-1. Assisting was Kravchenko, who dangled around a defender to create a 2-on-1 chance and made a skilled pass that Iacobellis buried past a lunging Boyle. From there, the script was all too familiar for the Minutemen. A shorthanded goal by Evan Campbell cut the lead to 3-2 at 11:07 of the third. And with just 2:15 left, Michael Kapla blasted a point shot home to bring the teams even. Both sides had scoring chances in the five-minute overtime but neither converted for a game-winner. 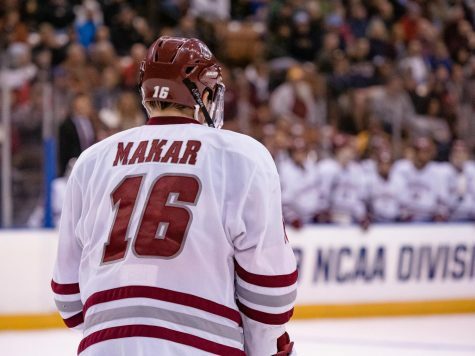 A sticking point for UMass in the tie will be its power play performance. The Minutemen finished 0-for-4 on the power play for the night and had three failed chances in the last 12:20 alone. 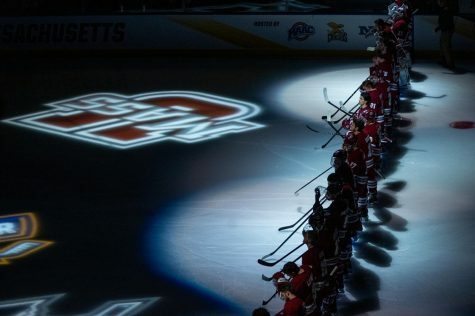 The Minutemen were without senior captain Troy Power for the second game in a row after he suffered a head injury against Northeastern Feb. 6. Micheletto said the team would evaluate Power Saturday morning but said it would probably be at least another week until Power could potentially return. The second game of the home-and-home is set for Saturday at 4 p.m. at Tsongas Center in Lowell.